We are here to present the gospel to unsaved children and to disciple saved children in their Christian walk. Evangelism and discipleship go hand in hand and are central to living out the Christian faith. It has been shown that it is much more likely for a young person to receive Christ than it is for an older person. Children begin forming their beliefs about the world at a young age, and it is important that we as Christans get the gospel to them during these formative years. Just as you would not wait until a child is thirteen to begin teaching them reading and comprehension, you should not wait to begin teaching them about Christ. AWANA is here to help you train your child in the Christian faith through Bible memorization, games, and Bible–focused messages every week. We want to fulfill the great commission in our hometown and surrounding areas, and teaching children is a central part of this. 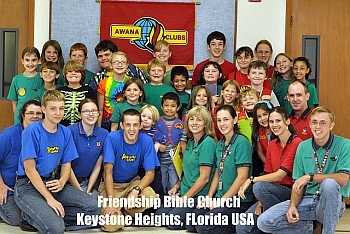 Please use the information on this site to help you understand our AWANA program and our heart for children. We would also love to see your entire family on Sunday morning for Sunday School and our Worship Service. Come and join with Friendship as we live our lives for Christ!